caught alive in the Everglades. It was found to have eaten a six-foot alligator. For centuries, the animals that thrived in Florida’s Everglades included numerous raccoons, possums, bobcats, rabbits, and other mammals. Recently, though, in some areas within the national park, sightings of these indigenous species have plummeted by as much as 99 percent. The reason is a strange one: Burmese pythons have practically wiped out the small mammals. Some of the pythons—constrictor snakes that can grow to be 19 feet long—got into the Everglades when irresponsible pet owners set them loose. Others escaped from their cages. What the meat-eating snakes found when they got to the vast wetland was a veritable paradise of water, shelter, and readily available food. The snakes quickly multiplied; estimates of their current population range from 5,000 to 180,000. The pythons now pose a serious threat to the region’s mammal population. As a result, Florida is allowing hunters into the national park to kill as many of the snakes as possible. Cash prizes provide an incentive for the hunters, who are also allowed to sell the hides of any pythons that they kill. Although consuming the snake meat is legal, high levels of mercury make doing so unwise. The big snakes are quite elusive, however. By January 25, only 30 had been killed. But even that small number can help wildlife biologists learn more about the snakes and perhaps lead to methods to control them. Florida’s python problem is just the latest chapter in a long tale of invasive species and the destruction they cause. On the island of Guam, brown tree snakes have devastated the native bird population. Rabbits were introduced to Australia in 1788; they quickly multiplied and devoured crops. In New Zealand dogs, cats, and stoats (a type of weasel) have preyed on the island nation’s flightless birds. In an ironic twist, the stoats were imported to control the burgeoning rabbit population. This site keeps a count of how many pythons have been killed, along with other topics. 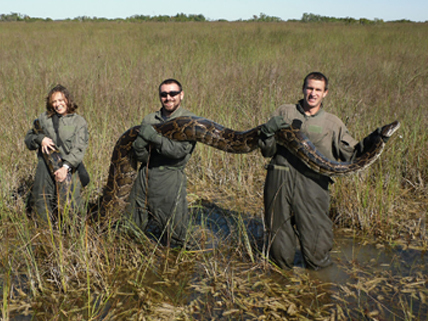 This article follows-up the outcome of the Burmese python–hunting challenge in the Florida Everglades, and tries to answer the question: You did what?! Check out these photos of wildlife biologists catching some very large snakes. Follow the links on the left for all you could possibly want to know about pythons in Florida. This USDA website focuses on invasive species in the United States but also examines issues around the world. Cool but poor animals that were eaten. why didnt we fix the poblem before it became a huge problem. I can’t believe they have found a big snake. it reminds me of the movie Anaconda lol. I’ve been absent for a while, but now I rebeemmr why I used to love this website. Thanks, I’ll try and check back more frequently. How frequently you update your site? I can’t believe that is a big snake. it is so big that it reminds me of that Movie about the big Snake which is called Anaconda.